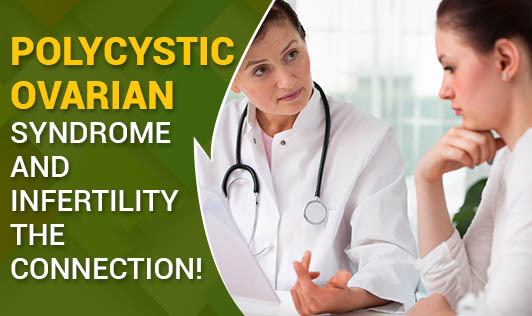 Polycystic Ovarian Syndrome and infertility – The connection! Polycystic ovarian syndrome (PCOS) is a condition common in many women of the reproductive age. It is characterized by changes in the ovarian cycle due to alterations in the hormone levels. Generally, the ovaries have small fluid-filled sacs called follicles or cysts. The eggs are present within these and when the egg matures, the follicle breaks open and the egg is released. This entire process of ovulation and development of the egg is under hormonal control. Any changes in the hormones can alter the process. In women with PCOS, the ovary doesn't make all the hormones needed for the complete maturation of the egg. The follicle/cyst may start building up fluid but the egg does not mature and is not released. Instead, the egg remains in the follicle itself. When ovulation does not occur, the hormone progesterone is not made. Without progesterone, a woman's menstrual cycle is irregular or absent. The ovaries start making the male hormone testosterone which is associated with most of the characteristic symptoms of PCOS like excessive body hair, acne, weight gain, deepening of the voice, and decreased ovulation. PCOS is shown to be heavily tied with infertility. Since PCOS alters hormonal functioning in women, becoming pregnant or sustaining a pregnancy is less likely to occur. Women with PCOS often produce too much estrogen, resulting in an unusually thick uterine lining. Elevated estrogen levels over a long period of time can lead to an increased chance of developing ovarian, uterine, or cervical cancers. Women with PCOS and fertility issues may also have other problems associated with PCOS like being overweight and having high insulin levels that can increase the risk of infertility. These issues can also lead to problems in pregnancy like gestational diabetes and pregnancy induced hypertension (preeclampsia). Women with this condition are encouraged to seek treatment as soon as possible. All of these conditions are preventable and treatable with early detection and treatment.